LiteSpeed Blog / Products / LiteSpeed Web Server / Win an Upgrade to a Free Site Owner License! Calling all Free Starter License Customers! We want to hear about your experiences so far using this new license. Our favorite stories will win a permanent upgrade to a Site Owner License for free! Write something up about your LiteSpeed experience with the Starter License. This can be a blog post, a public Facebook post, a series of before and after PageSpeed score screenshots, a love poem, or whatever you like. Be creative – tell your story in words, or in images, or both. 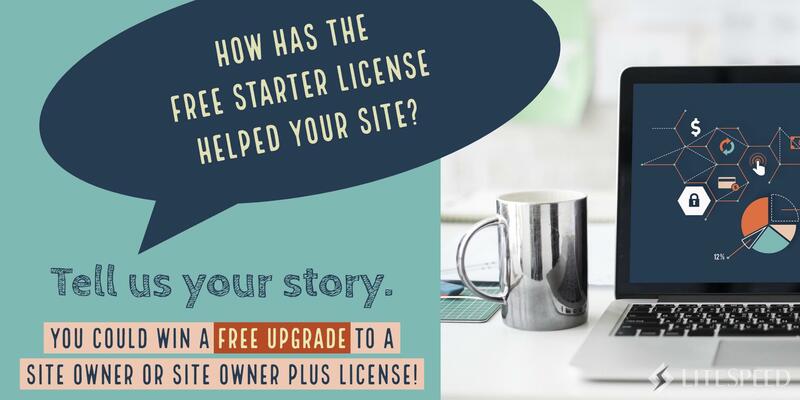 How has your site/business/life changed as a result of the Free Starter License. Is the site faster? Is it a LOT faster? Are you finding certain tasks easier? Have your visitors noticed? These are examples of things you can write about, but really, it’s entirely up to you! Just make sure that you are specific about the impact LiteSpeed has had on your own site. Write up your entry and post it wherever you like. Share a link to your entry on Twitter using the #GoLiteSpeed hashtag. Don’t forget the hashtag! This is the only way for you to officially submit your entry. Tweet the link with hashtag by January 15th. Our team will look through all of the entries and choose our three favorite stories. If you submitted one of our favorites, you will win a free upgrade to a Site Owner license for the featured domain! We will announce the winners by the beginning of the year. Entries posted later than the above date will be included in the following month’s contest. Non-winning entries may be tweeted again to be entered in the following month’s contest. Only one entry per domain will be accepted, though you may tweet your entry multiple times. Favorites will be at our discretion. Two of the three winners will receive a free, permanent upgrade to Site Owner, which supports 5 domains, 1 worker, and 8GB RAM. The winner with the most retweets as of the close of entries will receive a free, permanent upgrade to Site Owner Plus, which supports 5 domains, 1 worker, and Unlimited RAM. Winners must provide domain name upon request, and domain must be running on a valid LiteSpeed server under the Free Starter license. Prizes have no cash value and cannot be traded or exchanged. Good luck! We look forward to reading your entries! Would you count OLS experience? No, I’m sorry. This current contest is only open to users of our new Free Starter licence for LSWS Enterprise.